This example features the use of ODS Graphics in the process of building models by using the REG procedure and highlights the use of fit and influence diagnostics. Output 83.1.2 shows the default output produced by PROC REG. 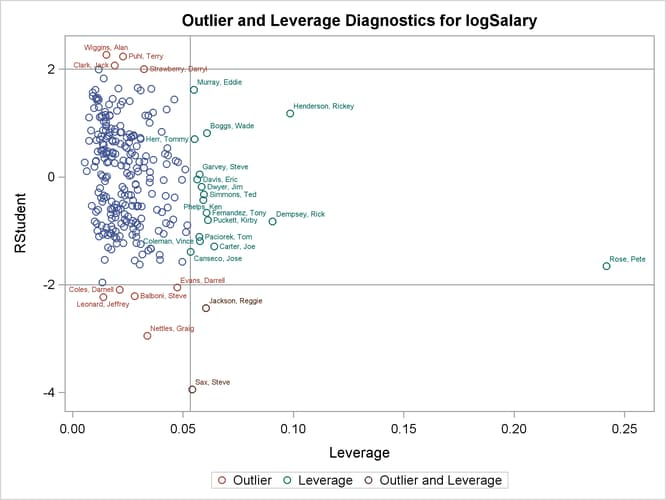 The number of observations table shows that 59 observations are excluded because they have missing values for at least one of the variables used in the analysis. 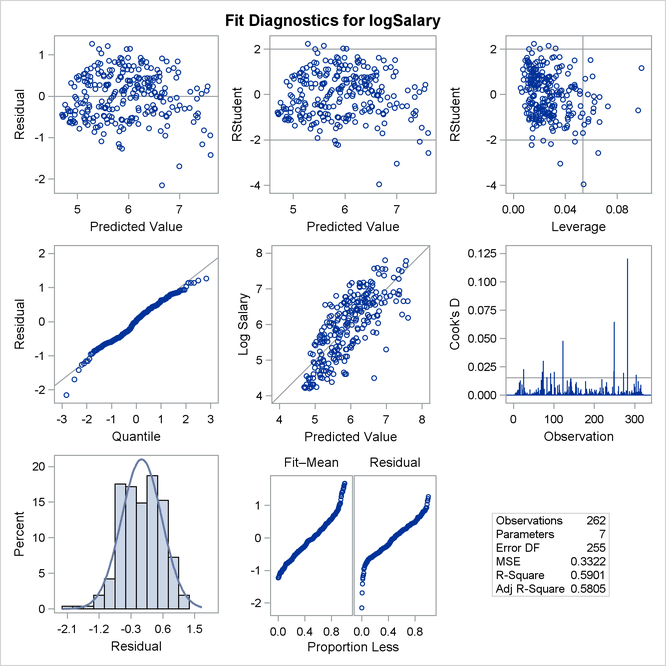 The analysis of variance and parameter estimates tables provide details about the fitted model. 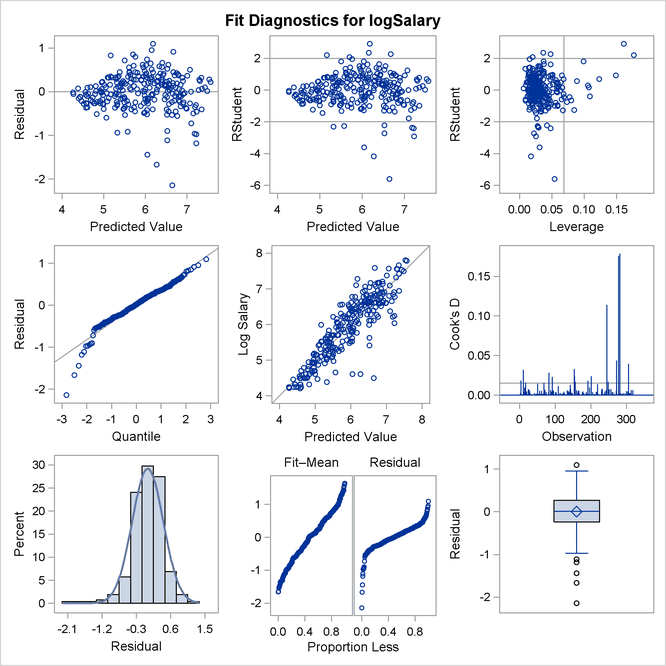 Before you accept a regression model, it is important to examine influence and fit diagnostics to see whether the model might be unduly influenced by a few observations and whether the data support the assumptions that underlie the linear regression. To facilitate such investigations, you can obtain diagnostic plots by enabling ODS Graphics. Output 83.1.4 and Output 83.1.5 reveal that Pete Rose is the highly influential observation. 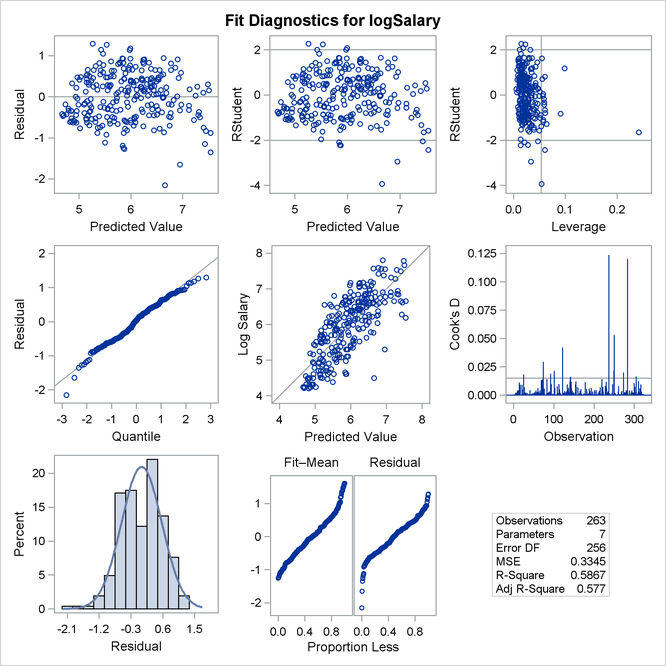 You might obtain a better fit to the remaining data if you omit his statistics when building the model. The following statements use a WHERE statement to omit Pete Rose’s statistics when building the model. An alternative way to do this within PROC REG is to use a REWEIGHT statement. See Reweighting Observations in an Analysis for details about reweighting. Output 83.1.6 shows the new fit diagnostics panel. You can see that there are still several influential and outlying observations. 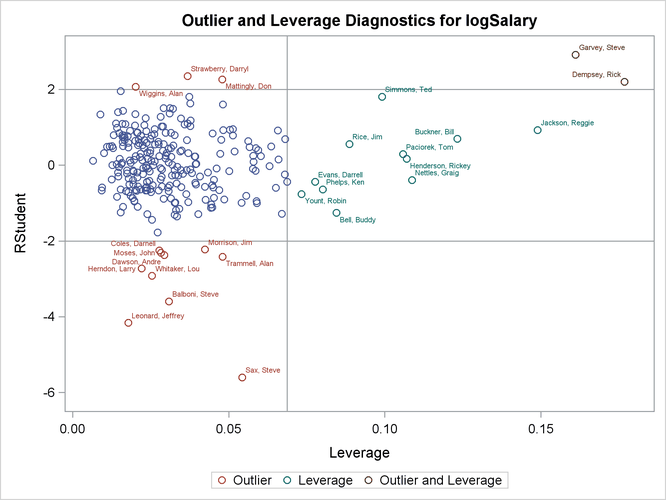 One possible reason for observing outliers is that the linear model specified is not appropriate to capture the variation in this data. You can often see evidence of an inappropriate model by observing patterns in plots of residuals. 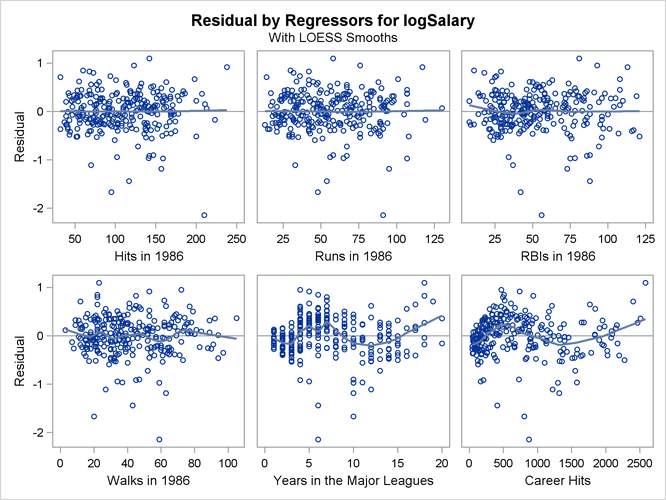 Output 83.1.7 shows plots of the residuals by the regressors in the model. When you specify the RESIDUALS(SMOOTH) suboption of the PLOTS option in the PROC REG statement, a loess fit is overlaid on each of these plots. You can see the same clear pattern in the residual plots for YrMajor and CrHits. 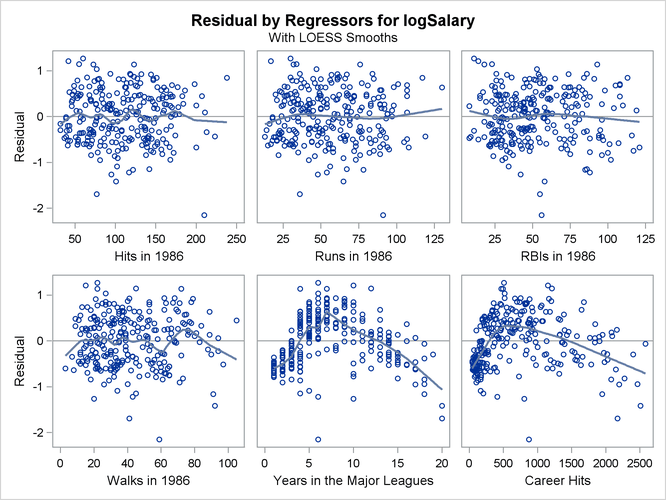 Players near the start of their careers and players near the end of their careers get paid less than the model predicts. Output 83.1.8 shows the analysis of variance and parameter estimates for this model. Note that the R-square value of 0.787 for this model is considerably larger than the R-square value of 0.587 for the initial model shown in Output 83.1.2. 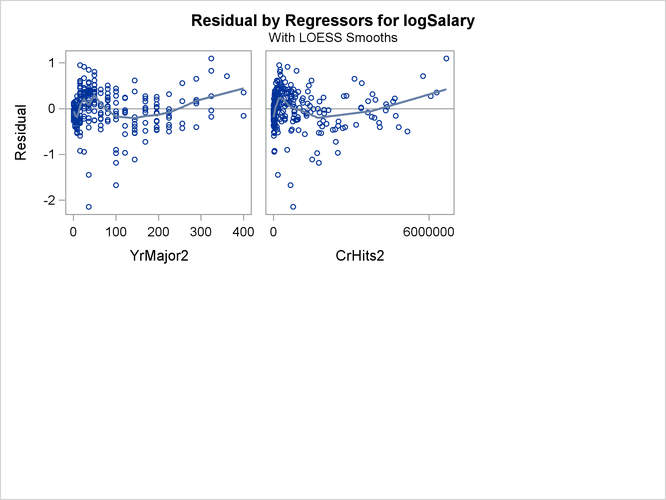 The plots of residuals by regressors in Output 83.1.9 and Output 83.1.10 show that the strong pattern in the plots for CrMajors and CrHits has been reduced, although there is still some indication of a pattern remaining in these residuals. This suggests that a quadratic function might be insufficient to capture dependence of salary on these regressors. Output 83.1.11 show the diagnostics plots; three of the plots, with points of interest labeled, are shown individually in Output 83.1.12, Output 83.1.13, and Output 83.1.14. 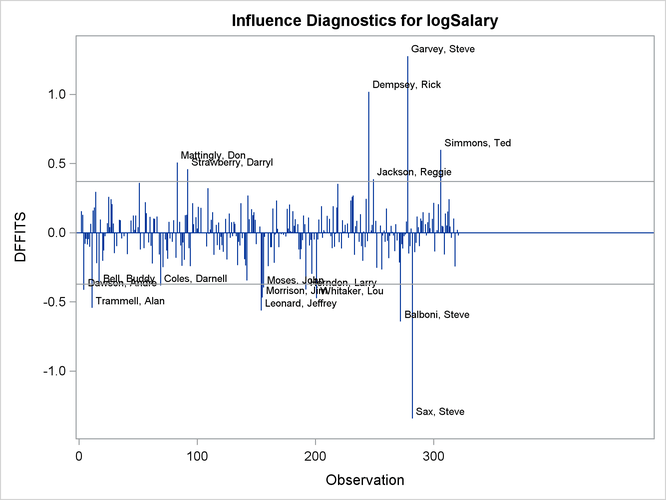 The STATS=NONE suboption specified in the PLOTS=DIAGNOSTICS option replaces the inset of statistics with a box plot of the residuals in the fit diagnostics panel. 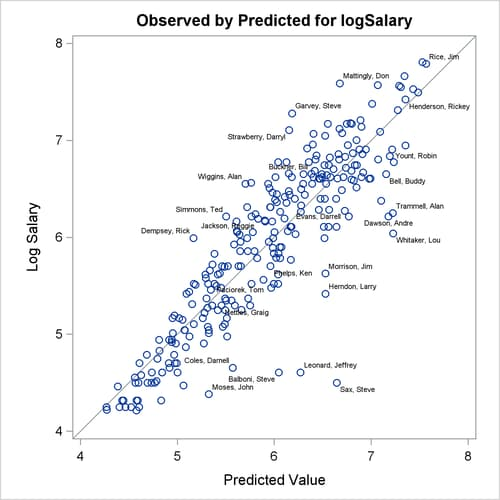 The observed by predicted value plot reveals a reasonably successful model for explaining the variation in salary for most of the players. 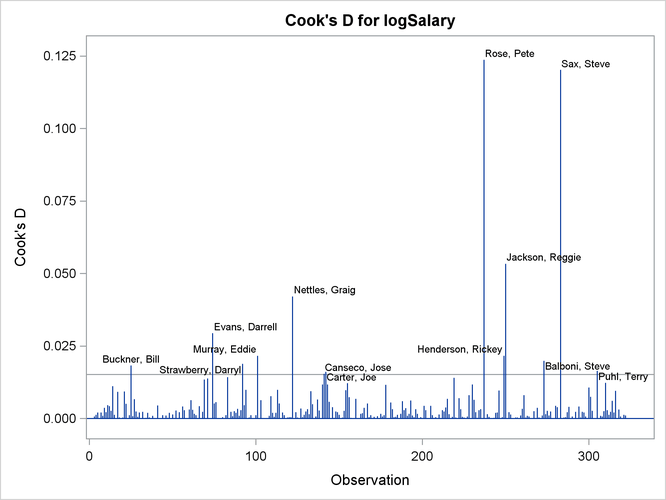 However, the model tends to overpredict the salaries of several players near the lower end of the salary range. This bias can also be seen in the distribution of the residuals that you can see in the histogram, Q-Q plot, and box plot in Output 83.1.11. 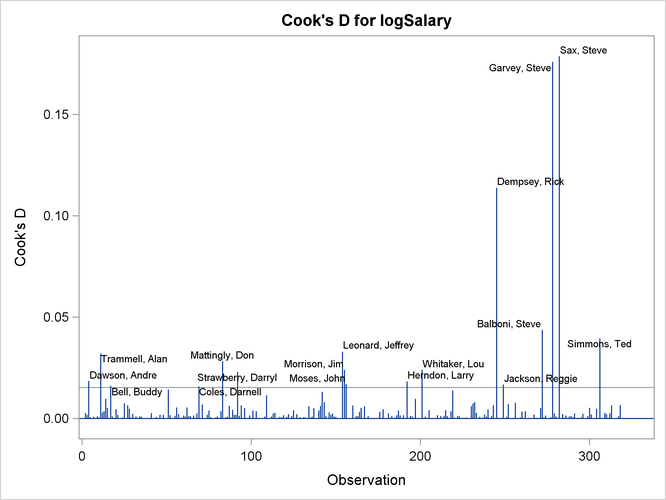 The RStudent by leverage plot in Output 83.1.12 and the Cook’s D plot in Output 83.1.14 show that there are still a number of influential observations. 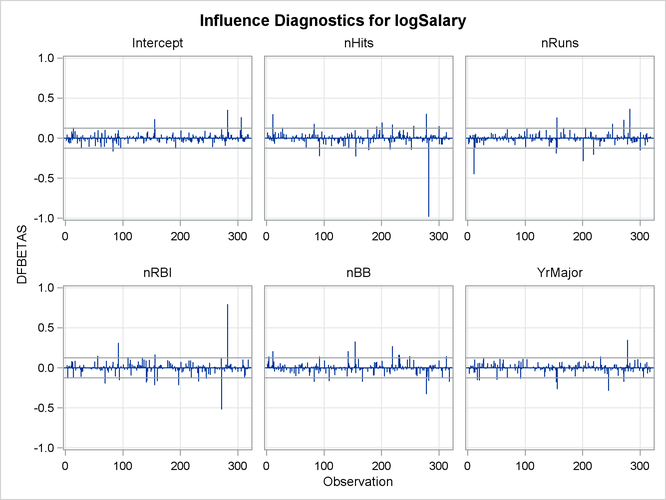 By specifying the DFFITS and DFBETAS suboptions of the PLOTS= option, you obtain additional influence diagnostics plots shown in Output 83.1.15 and Output 83.1.16. See Influence Statistics for details about the interpretation DFFITS and DFBETAS statistics. You can continue this analysis by investigating how the influential observations identified in the various influence plots affect the fit. You can also use PROC ROBUSTREG to obtain a fit that is resistant to the presence of high leverage points and outliers.